The first bang sounded distant and muffled. On the fourth floor, Bertillia Lavern assumed somebody downstairs was setting up for an event and had dropped a folding table. But when the bangs kept coming, Lavern recognized the sounds. Years earlier, before taking a civilian office job at Naval Sea Systems headquarters, Lavern was a Navy medical specialist. Known as a corpsman, she'd been on training operations with the Marines. She knew the snap of gunfire. The 39-year-old hit the ground and scurried under a desk with her supervisor in a nearby cubicle, she said. They stayed there silently as the shots continued. From that vantage point, the building's open floor plan allowed her to view the fifth floor, where she saw someone moving. "Get down!" she screamed, emerging from her hiding place. She remembers her supervisor, Andy Kelly, making the same demand of her. And she remembers a bright flash of light. "Glass shattered right by my head," she told The Associated Press in a phone interview on Thursday. "It was on the edge of Andy's cubicle." Lavern's account is the most detailed yet by someone who was inside the Navy Yard when former Navy reservist Aaron Alexis, a contractor who had worked at the Navy Yard for less than a month, shot and killed 12 civilians on Monday before being killed by police. Lavern said she and Kelly ducked down again and waited for a break in the shooting. "We realized then we had to get out of the building," she said. "Andy looked around the corner to check that the coast was clear." Lavern crawled to her desk to grab her identification badge and her purse. From there she saw her colleague, Vishnu Pandit. Pandit, 61, had spent 30 years with the Navy. Known to his coworkers as Kisan, he had two sons and was a grandfather and lived in North Potomac, Md. He was the first person she greeted at the office each morning. And he had been shot in his left temple. Using tissues from his desk, Lavern pressed her hand against her friend's head. She held him there and prayed over him. "I felt him breathe," she said. She felt for his pulse. Amazingly, it was strong. She turned to Kelly: "We need help now!" Kelly ran for help and Lavern stayed behind, she said. She did not know where the gunman was. "Stay with me," she said. "I'm right here." She told him that God loved him, that his friends loved him, that they wanted him to stay with them. "We don't want you to go," she told him. Three security guards arrived. They carried Pandit to an office chair, rolled him to the stairs and strapped him into an evacuation chair used to help disabled people quickly escape. "We lifted, dragged the chair down the stairs." At every floor, she said, she checked his pulse. It remained strong. When they got to the second floor, she said, the security guards' radios came to life: "The shooter was on the first floor," she said. "On the west side." Exactly where they were heading. They continued downstairs and escaped through a side door, where she said they found a security guard in an unmarked car. A gunman was on the loose and the security guard was worried about leaving his post. Still, he took Lavern and Pandit into the car and raced off. They made it off the grounds of the Navy Yard and to a street corner a few blocks away. The security guard needed to get back to his post and asked police who were there to get an ambulance immediately. Lavern eased her friend to the pavement. His pulse was gone. Across the street, James Birdsall was having his morning coffee in his office on the 11th floor at Parsons, an engineering company. As he and his colleagues watched the police cars screaming toward the Navy Yard, Birdsall noticed a man lying down on the street corner below at New Jersey Avenue and M Street. Birdsall assumed someone had had a heart attack. His company had trained him to use a defibrillator but the man was all the way across the street and there was already a woman giving CPR. "But I thought, 'If don't do this now, I'm going to look back and say I should have,'" Birdsall said Thursday. So he grabbed the defibrillator and ran. The 11-floor elevator ride seemed to take especially long. The run through the lobby and across the intersection remain a blur. Birdsall knelt at Pandit's head while Lavern pumped at his chest. That image was among the first to surface from the Navy Yard shooting Monday in a photo that was taken by congressional staffer Don Andres and circulated on Twitter by Tim Hogan, a spokesman for Rep. Steve Horsford, D-Nev. Almost immediately, there were questions about what it showed. Was it really a shooting victim? If so, how did he get blocks from the scene? There was speculation that someone had a heart attack, unrelated to the chaos blocks away. But Birdsall saw the gunshot wound to Pandit's head. He attached the defibrillator's two pads to the man's chest. The machine said not to administer a shock, Lavern said. So she continued giving CPR. Others came to help and Lavern kept talking to her friend. Birdsall could tell that from the way she kept saying his name that she knew him well. Within two minutes of being dispatched, an ambulance arrived. Lavern asked to go to the hospital with him but a detective told her she needed to give a police report instead. She removed Pandit's badge and gave it to rescue workers so they would know who he was. The Associated Press had distributed two photos Andres took on Monday but hours later withdrew the photos until it could be verified they were related to the Navy Yard shootings. The AP reissued the photos along with this story. 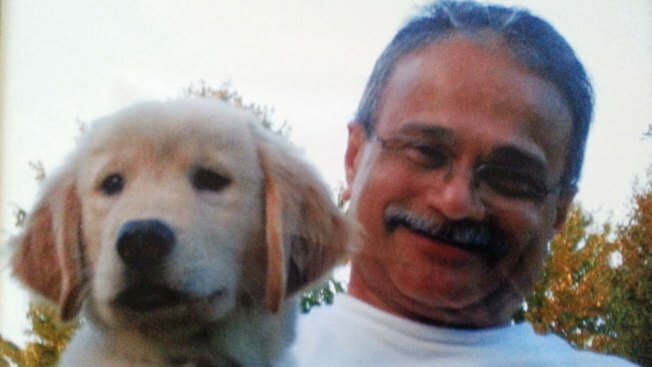 Pandit was pronounced dead on arrival at George Washington University Hospital, where Dr. Babak Sarani, the hospital's director of trauma and acute care surgery, called the injury "not survivable." Lavern, a mother of one from Stafford, Va., attended Pandit's funeral on Thursday. "He was a good friend," she said. "He was the sweetest man." Her husband, Navy Lt. Cmdr. Randall Lavern, said he wasn't surprised at her actions. "That's my wife," he said. "She's always the one running to help." Associated Press Writers Ben Nuckols and Jessica Gresko contributed to this report.